This entry was posted on Monday, March 28th, 2011 at 5:00 am	and is filed under Change, Choices, Reading, Self Improvement, Vegetarian Experiment. You can follow any responses to this entry through the RSS 2.0 feed. Both comments and pings are currently closed. I can’t pay 16 bucks for a chicken, either. And yes, I feel guilty about it. But seriously, while I admire the argument for sustainability, I think it’s not realistic for many people with limited incomes. We can’t afford to eat all organic, all the time. I can’t pay 6 bucks for a little container of blueberries. It’s a conundrum, that’s for sure. I pay a lot for organic milk and eggs. We haven’t moved into organic yogurt and cheese yet though. But I don’t blame you for not spending $16 on the chicken. As the TKW points out, there’s a monetary limit to what each of us can do, and I’d add that there is a reasonableness limit too. While you could have afforded a $16 chicken I’m sure, it isn’t reasonable, and where do you stop from there? Your post reminds me to be grateful that my father-in-law raises angus cattle, and that my sister-in-law raises chickens (albeit not enough to completely supply us year-round with chicken, and not close enough to provide us with eggs). Your post also has reminded me to take up a nagging question about the slaughterhouse/butcher we use for the angus. I’ve been meaning to go check it out to see how clean it is, if they have a Temple Grandin design and just how their employees treat the cattle as they are herded. Oh yes, this internal conflict comes up every week during our meal planning & grocery shopping. Would I pay $16 for a chicken? No. 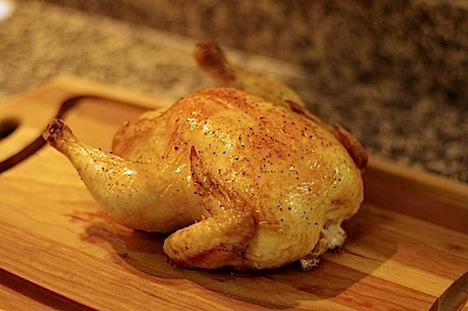 Is a humanely & healthily-raised chicken that can feed 3-4 people worth $16? Well maybe it is. But even for those of us that could afford it (and yes, I probably could, though I’d have to cut back on something else if it became a frequent purchase, and if we had more mouths to feed it may no longer be the case) it seems so far beyond our context of what our culture (the U.S., specifically) believes food should cost. We are accustomed to food purchase accounting for much less a percentage of our income than many other countries and for meat to be an everyday, inexpensive staple rather than a once-in-a-while special treat. Our guilt is up against a pretty deeply entrenched sense of the monetary value of items. And then there are the many many people who cannot afford $16 chicken yet still care about the ethical aspects. Obviously, it would be ideal if all animals were raised & slaughtered humanely—the $3 chicken would disappear, and the $16 chicken would likely end up somewhere in the $8 range (total wild guess) and we would all probably eat less chicken, but feel better about it when we do. I suppose the only way this would ever happen is if people actually stop buying the $3 chicken. And i mean ALL people. Does each person’s individual impact mean enough that it is worth it for me to stage my own boycott? I’m honestly not sure. Laura H. – If you haven’t read The Omnivore’s Dilemma, you should. He dedicates a portion of the book to Grandin’s work. It’s a pretty fascinating read overall, actually. Ana – You make a great point about what it would take for us to make the $3 chicken to go away. I saw Michael Pollan on an episode of Oprah last year and he talked about how we, as regular civilians, may not have any secret access into the world of “big ag” but we each vote with our forks three times a day. As all the commenters have pointed out today, there are people who could not pay $16 for a chicken. And as long as $3 chickens exist, they don’t have any real incentive to reduce the amount of meat in their diet due to cost constraints. So (absent some kind of government regulation) the $3 chicken is here to stay and we are forced with the very relevant question you asked in your comment: Is it worth it for me to stage my own boycott? Despite my recent failings, my answer is usually Yes, but not because I think my behavior alone will change the system. It’s typically because I think that the more humanely raised animals are healthier for us, and because I have some guilt over buying factory-farmed meat. My solution has been to buy animal meat and other byproducts at Whole Foods (which means a second grocery trip, which is a hassle, which is why I’ve been slacking lately). You pay more of a premium to buy free range and organic meats and dairy at a regular chain grocery store because in that context they are considered specialty items. Whereas at Whole Foods they are not so special and actually cost a bit less. Thanks for these thoughtful comments. I’m glad to know I’m not the only one who wrestles with this. That chicken looks beautiful! Nice work on the cooking and the photography. I hear you, about this moral dilemma. My internal argument is a little different: cost vs. health/safety. I know it’s healthy and safer for me to eat organic foods, but sometimes I just can’t swallow the price differential. It’s about perceived value. But, having grown up on a small family farm, this issue is near and dear to my heart. I appreciate the care my parents put into the beef they raise, and want to support others who also raise their crops and animals carefully. I think – as with any tradeoff like this – we try to do the best we can, most of the time. Forget the all-or-nothing mentality. It’s too much to eat local, organic foods 100 percent of the time. But if we can make substitutions here and there, that helps too. You raise an essential fact: dietary morality is fine, if you have the resources to accommodate it. In other words, the time and the budget. I met someone recently who is very big on careful eating, certainly doesn’t live high off the hog (excuse the expression), but primarily shops organic. He does it as a matter of health, and I respect that. But this person is done raising kids, done paying for schools, done with crazy schedules and never enough time to get everything done. It’s a whole other world. Or rather, a Whole Foods other world. At the same time, he does without fancy digs, without a fancy car (and thus also doesn’t gas guzzle), and is generally respectful of all things environmental. I find this overall sensitivity / morality about consumption (human and otherwise) to be measured, and I admire it. But the bottom line remains – the bottom line. Most of us simply can’t afford to purchase and eat this way. I’ve run into this very dilemma. I used to roast chickens all the time, and I love them. How have I dealt with the $13 difference? Honestly…I haven’t bought a whole chicken from the store in a couple years. It bugs me that I, too, can’t bite the bullet and buy the more expensive chicken, because I believe in “voting with my fork” as well. It frustrates me to no end that it’s cheaper for someone to buy a big mac than fresh broccoli, so I try to support local farmers and all that…but it’s way easier to do that where I live. I fail a lot when it comes to food as well, but I agree with everyone that you just have to do the best you can as often as you can. The result for me is that I frankly buy less meat than I used to, and we eat more veggies and stuff I can more easily afford. I just bought a chicken here (Tanzania) yesterday to roast and couldn’t remember what they cost back in the US. I paid $7 and its from a butcher. Wow, $3, what a steal! But I think you’re being overly hard on yourself over the purchase of the chicken. I admire your willingness to change your eating habits, but like other commenters have said, you can only be ethical where your budget/time allow. Sounds like you’ve already reduced your footprint by leaps and bounds so just work in the areas where you can. I mean, me giving $100 to the Red Cross isn’t going to solve the problems in Japan at the moment, but that’s how I can help now and its better than spending the money on highlights for my hair! But if I could be devil’s advocate for a minute (and I will disclose I’ve never read any Michael Pollan literature), I used to work for the American beef industry and have visited numerous farms, feed lots and packing plants and the industry is not as bad as its made out to be. No doubt, there’s always room for improvement. But the industry has a financial incentive in producing humanely-raised beef because they see it on their bottom line. Its not in their interest to use antibiotics (b/c they cost money) unless the cow is sick. Its not in their interest to over populate the feed lots b/c cows are big and bump into each other which results in bruised meat and lower revenue. Its not in their interest to put the cows under stress (prior to harvest) b/c stressed cows = less tender meat (all packing plants use Grandin-designed processing chutes, she’s a huge advocate for the industry). Yes, it’s a commodity-driven industry so volume equals revenue, but when the volume is made up of prime beef steaks and roasts and not select ground beef, the industry gets more money in their pockets. Anne – That is the appropriate solution. If you can’t bring yourself to pay $16 for a chicken (or can’t afford it at all) and have moral objections to the $3 chicken, you just shouldn’t buy the chicken. There are plenty of ways to get protein into your diet without meat and without breaking the bank. In retrospect, that’s what I wish I’d done. Rebecca – Thanks for playing devil’s advocate. All of what’s written about factory farming comes out against it. Big ag does its work behind closed doors with lobbyists, not in books and documentary films. It’s not like they could come out and say “feedlots are really awesome” because that’s not the truth, but you make some good points about their quality incentives. Nevertheless, I remain skeptical of the industry. There’s a lot of secrecy there (I’ve heard rumblings of new legislation to make it illegal for people to film factory farms) which doesn’t do a lot for my trust. But there are two sides of every issue and I appreciate your representing the other side of this one. I think you’re being too hard on yourself. I understand this food revolution, but I also feel that there are so many other things going on that it’s hard to keep up. There seems to be this idea in our culture that because of technology and medical breakthroughs, we should be able to get to this perfect place where we are perfectly healthy and everything is just perfect. But it can never be that way. There is no “old days” to go back to, really. People might have raised and killed and cooked their own chickens and vegetables, but they also died of consumption or the flu. So while I want to eat healthy, I am mostly limiting my meat and doing what feels right. And if your roast chicken feels right, just eat it, girlfriend. Jana – Thanks for your comment. I guess there’s a part of me that thinks, “But I know better!” It’s hard to tune that out. You make some good points, though. It’s easy to look at what was great about the era of pre-industrial farming without also accounting for things like refrigeration and modern medicine.